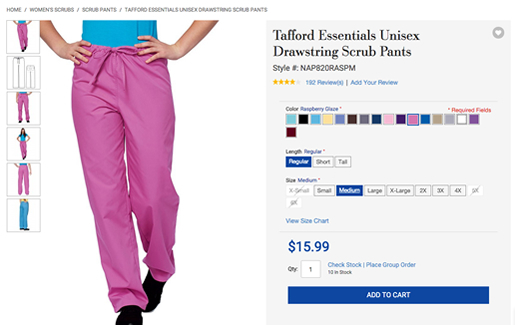 Tafford Uniforms is one of the world’s largest eCommerce retailers of healthcare scrubs and accessories. They are a headquartered in Charlotte, North Carolina, selling nursing uniforms and accessories directly to healthcare professionals. 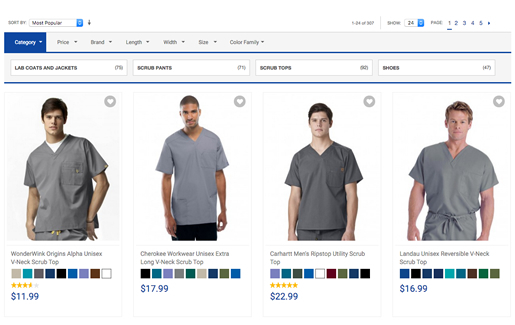 Tafford specializes in carrying a unique blend of privately branded products, along with other popular medical uniform brands. The Tafford website was in need of an upgrade. It was using a heavily customized, older version of Magento Enterprise. 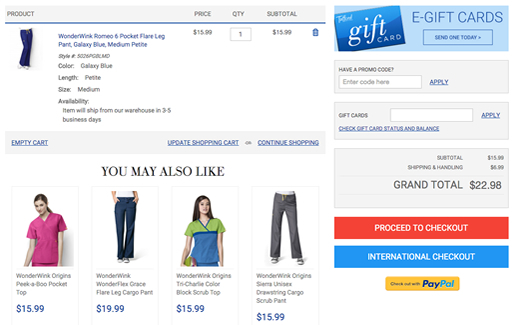 Shoppers were encountering page-load issues, leading to a decreasing conversion rate. Behind the scenes, the Tafford team was fighting malfunctions throughout the site, and dealing with broken extensions and misfiring customizations. InteractOne was tasked with upgrading the current site to a fully responsive Magento Enterprise site that can be easily maintained. Keeping customizations to a minimum was a priority, both for cost and for functionality. InteractOne avoided Magento core modifications for all required customizations, preserving the upgradability of extensions and reducing potential conflicts throughout the site. The outcome is a fully responsive Magento Enterprise site that’s able to be easily maintained and upgraded. Because of Tafford’s large product catalog – particularly the thousands of product variations due to color and size options – InteractOne optimized the configurable product matrix to manage all of the options and color swatches. One of the main goals of Magento 2.0 was to address this shortcoming in Magento’s database structure that limited the success of the platform for apparel retailers and others who required complex item configuration. The fact that Tafford is able to manage fast page load on a pre 2.0 Magento site is a testament to our optimization effort. 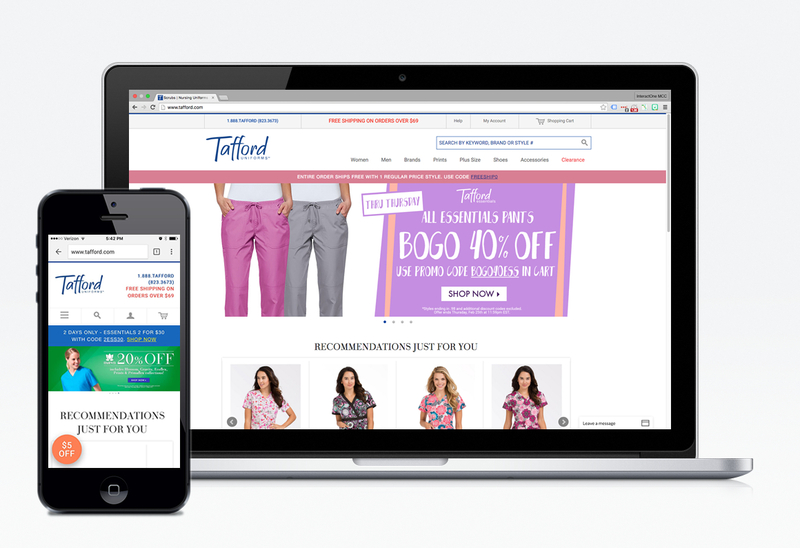 The upgrade opened the door for Tafford to move to a fully responsive design. 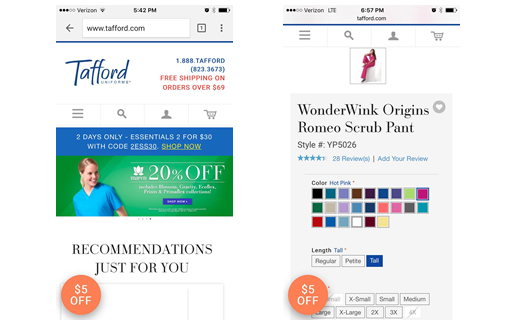 The new design allows mobile shoppers easy and complete access and gives Tafford a competitive edge. As well, since Google favors responsive and mobile friendly sites versus those who do not enable such access, organic traffic has increased by a significant percentage. Finally, all extensions were evaluated and upgraded for use with the new Magento codebase. This attention to detail helps to resolve any core hacks and possible conflicts with third-party software and integrations.